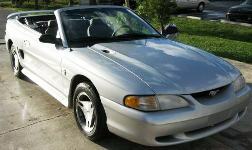 The 1998 Mustang came in a 2 door coupe and convertible. Three models included a base level V6, a V8 GT, and the V8 SVT Cobra. New to 1998 were modifications to the engines to allow for more power; a GT Sports Appearance Group; and a V6 Sports Appearance Group. The interior was modified to include a clock in the stereo and a CD player on all models. The SVT Cobra also got new 17x8 inch alloy wheels. 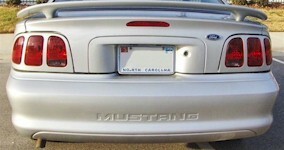 The 1998 Mustang GT came with 16 inch cast aluminum wheels, lower valance integrated fog lamps, single rear wing spoiler, racing cloth front bucket seats, leather wrapped steering wheel, optional upgraded rear axle, optional Mach 460 sound system, and the 225hp 4.6L SOHC V8 engine. GT Spring Edition The GT Spring Edition consisted of special factory installed black hood stripes and 17-inch wheels on a GT. They came in both coupes and convertibles. 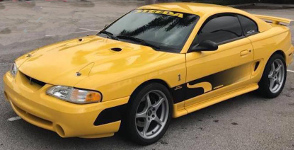 The 1998 SVT Cobra saw a few changes from 1997; yellow paint was available, a new 5-spoke wheel design was used, the under-hood tower brace was redesigned,a and there were a few interior changes. Standard equipment was ABS, sport seats, the premium sound system, power equipment, rear window defroster, AC, cruise control, floor mats, lighted visor mirrors, and key-less entry. Optional equipment was few; extra interior leather trim and a rear spoiler. See our 1998 SVT Cobra Data Explorer for more information. Saleen Mustang The 1998 Saleen Mustang received new rocker panel striping design and a new SSC hatchback model. Standard equipment included a top-shelf Pioneer KEH 6050 AM/FM cassette & BP 850 graphic equalizer audio system, 225/50VR-16 General XP-200V tires, Monroe stocks, Saleen style aerodynamic body kit, 170mph speedometer, Hurst shifter, articulated FloFit sport seats, special Momo steering wheel, and even a Saleen Mustang jacket to wear. 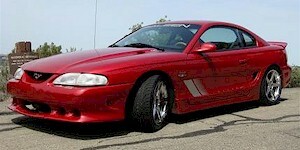 See our 1998 Saleen Data Explorer for more information. 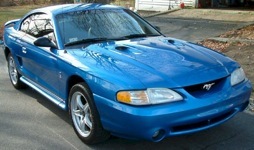 The 1998 Roush Mustang was the last of the first generation of Roush Performance modified Mustangs. Models included the appearance Stage 1, the handling improved Stage 2, and the engine upgraded Stage 3. Steeda Mustang The 1998 Steeda Mustang offered by Steeda Autosports came in three packages: Mustang, Mamba, and Cobra. The first level Mustang offered suspension, exhaust, and naturally aspirated engine improvements for the 4.6 2V. The Mamba package added a Vortech blower and additional suspension improvements to the Mustang package. 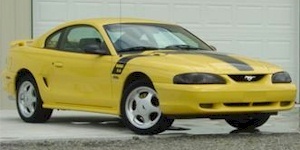 The Cobra leveraged the 4V platform as its canvas for Steeda’s best performing vehicle in 1998.